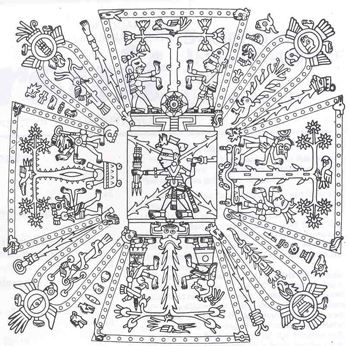 The cosmology of Mesoamerica society was another integral part of their religion. Its purpose was to give structure to and explanation of the universe. It is directly connected with the Mesoamerican gods and the spiritual world. The major feature of this cosmology is the World Tree. It embodies the four cardinal directions and connects the Underworld and the sky with the terrestrial realm. It may also represent the band of the Milky Way. Another part of the Mesoamerican cosmology is the world ages. We have been through four world ages and are nearing the end of the 5th on December 21, 2012. The ages are based on the alignment of the winter solstice and the dark rift of the Milky Way.